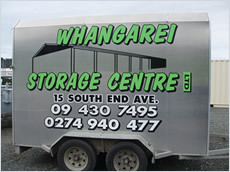 Whangarei Storage Centre - Storage units and sheds for domestic, commercial, long or short term secure storage. If you're looking for a storage unit in Whangarei, you can't go past the Whangarei Storage Centre. Dave Nesbit and his family started up back in 2003, so you're dealing with a 100% locally owned and operated business. There is a free move-in trailer and storage is available for both personal and business use. There is a variety of unit sizes, ideal for small personal furniture storage or right up to commercial storage of sensitive documents or office equipment. The site is accessed by a gate opened only by secure proximity keys and each unit is individually alarmed. There is extensive camera surveillance and sensor floodlights to detect movement outside the units. Locks are provided by the customer so that only you have access to the lock keys. UNITS FROM LESS THAN $5 PER DAY!